Genevieve Plaster, M.A. | February 24, 2015. 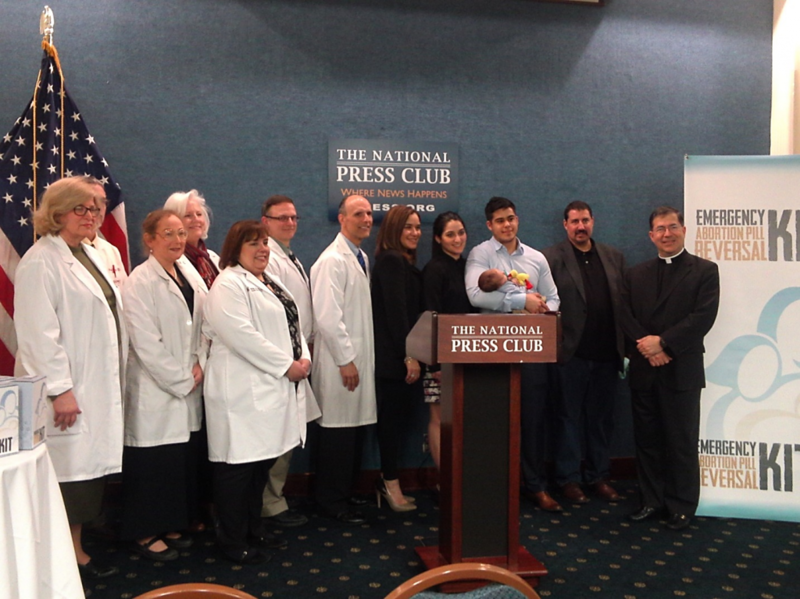 On February 23, the American Association of Pro-life Obstetricians & Gynecologists (AAPLOG) co-hosted a press conference with Priests for Life at the National Press Club to increase awareness about a relatively new medical protocol for reversing medication abortion and to unveil a new Abortion Pill Reversal Kit now available to doctors. Abortion Rill Reversal (APR) is a program that seeks to provide medical support to women who have taken mifepristone, the first of two drugs in the RU-486 abortion regimen, and then changed their minds, wanting to continue their pregnancy and save their baby’s life. APR connects with these women through its website (www.abortionpillreversal.com) and a 24/7 emergency hotline (877-558-0333) staffed by nurses and an international network of doctors and pregnancy medical clinic (PMC) hubs. The reversal works by utilizing the hormone progesterone to out-compete the ingested mifepristone and swamp its action. The developed protocol involves injecting 200 mg of progesterone intramuscularly as soon as possible after the woman has taken mifepristone. This dosage is repeated for two more days, then every other day until the 14th day since the mifepristone ingestion. Finally, the same progesterone dosage is administered only twice a week until the end of the first trimester. According to Dr. George Delgado, the medical director of APR, there have been 223 abortion pill reversals attempted from May 2012 to December 2014. Seventy-eight babies have been born as a result and 49 additional women who have taken the reversal treatment are currently still pregnant. There have been no major birth defects, which is unsurprising, said Delgado, as there are no reliable studies demonstrating any evidence of birth defects due to progesterone. Present at the press conference was Andrea Minichini, one of the mothers who regretted taking the abortion pill and who discovered APR. Minichini shared that she went to a Planned Parenthood in New Jersey with her boyfriend, Chris Caicedo, but was still ambivalent about taking the pill. She recalled holding it in her hand with growing hesitation – long enough for the Planned Parenthood doctor to chide her that the pill was “expensive” and “would melt” if she didn’t take it. With that, she swallowed the mifepristone. Immediately, she regretted it and rushed outside the facility to try and vomit, but to no avail. When she called the Planned Parenthood to see what could be done to stop the medication abortion, she was told that there was nothing else to do but take the second pill (misoprostol) so she would not be hurt. With the support of her parents and boyfriend, Minichini instead began her search online for help, which led her to www.abortionpillreversal.com. After getting set up with a doctor on the APR network, she underwent the progesterone treatment, and eventually gave birth to her now eight-week-old Gabriel in December 2014. Minichini’s mother teemed with joy, calling baby Gabriel the “light of our lives,” and expressing amazement that already he is bringing hope and awareness of the life-saving abortion reversal treatment. “It’s one of the best things I’ve ever done in my medical practice,” said Dr. Mary Davenport, on helping women through the APR network. Dr. Davenport is an AAPLOG physician who co-authored the first peer-reviewed medical article on mifepristone reversal with Dr. Delgado. For the best chance at abortion reversal, time is of the essence. According to an APR fact sheet, there is a 24 to 48 hour window after the mifepristone ingestion to begin treatment. With this urgency in mind, Dr. Delgado, appealed at the press conference for more physicians to join the growing network of around 230 doctors. According to Delgado, hundreds of women have already called the hotline, at a rate of about 40 calls per month. Dr. Delgado also unveiled the new Abortion Pill Reversal Kit at the press conference. The kits include the developed protocol for reversing mifepristone action and other APR resources. Though it does not include progesterone itself, it contains a list of pharmacies that carry progesterone in oil and a built-in spot for the vials so that everything needed for the treatment is organized together. It is APR’s hope that these small boxes would be available for women in emergency rooms and pregnancy resource centers. In 2011, medication abortions, or abortions induced with the RU-486 drugs mifepristone and misoprostol, accounted for 36% of abortions performed before nine weeks gestation according to the Guttmacher Institute. As medication abortions continue to expand in accessibility in the United States, it is crucial that there be enough doctors in every area available to offer the abortion reversal protocol and keep apace of the growing demand. Innumerable babies like Gabriel could be given a second chance at life and innumerable mothers given hope. For more information on Abortion Pill Reversal, to join the network of physicians or pregnancy resource centers, or to inquire about the new Abortion Pill Reversal Kit, please visit: http://www.abortionpillreversal.com. Genevieve Plaster is a research assistant for the Charlotte Lozier Institute.